One of the easiest ways to attract the right prospects to your network marketing business is with a blog. 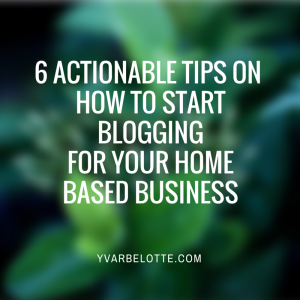 Learning how to start blogging for your business doesn't have to be complicated. You simply need to be educated on your options and go from there. If you are reading this blog post chances are you have been thinking about it for awhile. If you are new to my blog or me in general, I'm all about strategic branding. I'm a Part-Time Marketer. So everything I do has to be strategic in order to maximize my efforts. I've been blogging for years and it is one of the biggest leverage points in my business. I define a blog as a casual informative conversation with your audience. I call my blog my "Living Room On The Internet." My website is my home online but my blog is where I receive my guest and chat with them. I want to create a relaxed environment on my blog so people don't feel pressured and they see me as their trusted advisor. When you create your blog you will get to decide the feel and nature of your blog for your guest. It should feel inviting. This will become the #1 connection point for your business so how you get started matters. You want to create an online environment to attract the right types of people and repel those who are not a good fit. You've got to create this balance so your audience is crystal clear you are talking to them. I'm going to dive deep on some the basic ins and out of how to start blogging and getting your blog off the ground in the right way. Here we go, lets rock it out! Now, you would think the right answer would be because "Yvar told me too" but in reality that will not cut it. If you are not clear on why you are blogging you will not do it. So let me give you some insight as to why you should be blogging and why you will want to do it consistently. Blogging is a twofold thing. It's a open journal of what you are learning in life and in business and secondly it's a resource for your readers who are down the similar path and to give them guidance and understanding along the way. Your blog becomes a resource center for your audience. Just think of some of your favorite bloggers. Don't you go back over and over again for new content and to review the old content. Same will happen for your blog. When you start creating your content with your audience in mind first, then your audience will think of you as the go-to resource. A blog is the perfect play ground to create this type of engagement with your audience. Essentially you will be giving and giving and giving useful, practical, insightful, quality information and only then you can make offers. If you are not clear on your target audience in your marketing, chances are you are not getting the results you want in your network marketing business. Just imagine, your lack of clarify creates confusion for your audience and a confused mind does nothing. To move away from that you have to know to the letter who you are speaking to. Not only will this draw in the right types of readers you want on your blog but this also will put you in a category as a Specialist. See, when you are giving specific information to a specific audience you become a expert in that field area. If you've been stuck trying to figure out your audience for a good minute you are in luck because I have a resource for you that will make this process easy-peasy. I created it because I was struggling in this area for the longest and have gone on to give it to my coaching clients to use with great success. Click below to access yours. There are tons of things you can do to understand your market better. You can either pound the pavement or pound your mouse. I for one am all about leverage and I squeeze as much information as I can out of the Internet. Its easy, almost too easy, how with a few clicks of your mouse you can be in full spy-mode on your target audience. What matters is that you use your research for good. The purpose of your research is to know how your market is currently engaged online and what types of content would get their attention. Essentially this is the heavy lifting in your content creation. Content creation can be a major road block from getting started with blogging. I'm a big fan of tools because it makes things easier. Below are a few of my favorite research tools and exercises to use when creating content. Google Keyword Research-A must-use tool if you are trying to rank your content; Go after keywords with a search volume of 500-1000 searches +/-. Freedom Tip: The best advice I ever got on content creation was to use my training notes for topic ideas. Simply sharing or expanding what was insightful or inspirational for you. What gets scheduled, gets done and the same applies to you creating your blog content. If your schedule is busy like mines, my calendar keeps me on point. Try to have your content created weeks in advance. My ultimate goal is to have my content created 1 month in advance like a magazine. This is to reduce stress in creating the content and kind of have a more cohesive body of work for the whole month. But to date I usually create content one week in advance. The key to your success with your content marketing is to be consistent. To figure out how often you should put out content, take a look at your current business schedule and decided what you can commit to. Five days per week, three days per week, or maybe just 1 per week. Truth is the number doesn't matter as long as you are consistent with it. As a Part-Time Marketer I blog about 1-2 times per week. If you are Full-Time you should try for 3-5. Of course, the more you put out content the more exposure points you have working for you around the clock. But if you try to do 5 post per week for 1 week and do nothing for the rest of the month then you will lose trust with your audience. Finally we are here! Time to figure out which blogging platform works best for you. There are free ones like Blogger.com or Tumbler.com that can get your feet wet with blogging. But when you blog on a free blog platform you run the risk of losing your content since it doesn't belong to you. I've heard horror stories so you have to be extra careful to read the terms and conditions to make sure that your content meets requirements. Another option is to get a traditional WordPress.org blog. This is where most Guru Bloggers will recommend you to get started with. This is actually were I started blogging. There are a few pros and cons like anything else. The main pros is that its yours when you purchase hosting. The main con is that because it comes like a blank slate there are a lot of technical hurdles you've got to figure out. You'll have to put in a theme, plug-ins, and other customizations. Unless you are a IT genius this can be pure hell. I know it was for me and luckily I'm married to a techy smarty pants who put me out of misery and just setup my wordpress site for me. Now of course there are plenty of tutorials on Youtube and on the web that can help walk you through the setup process. But keep in mind that it is time intensive and that's all before you actually start writing anything. There is another option that most network marketing business owners are not aware of. Its having a done-for-you wordpress blog called Kalautu. Kalautu was design to allow you to login and start blogging with no set-up. 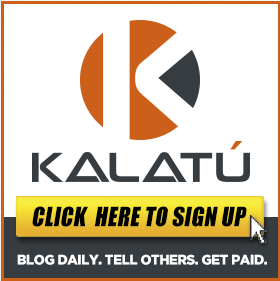 Kalautu is the first of its kind to be a for-profit blog. What that simply means is that as you are promoting your company through your content on your blog, you are also able to invite people to get their own blog and earn a commission from it. Pretty cool for passive income on the side. Now you may be in the same boat I was when I got introduced to Kalautu. I already had my own blog and been blogging for years now. At first it made no since to get another blog. But then I was explained the viral power behind Kalautu. It was built on a authority site which means its favored in the search engines. So I primarily use it as another traffic source. I put content on their to point back to my blog or video. You could do the same and get some link juice back to your blog. Let me show you what else Kalautu has to offer on how to start blogging for your network marketing business. A beautiful blog post that you spent hours on means nothing if no one sees it. I heard from a Blogger Guru (don't remember who), that you should spend twice as much time promoting your content than you did creating it. This is very true. Your blog is just one location and you have a bazillion other online locations your audience maybe gathering. It's easy to become overwhelmed with all the possibilities with syndication. Syndicating your content doesn't have to be complicated as long as you have the basics down. Youtube.com- This is Google's Wife, and she has a lot of pull in the search engines. 4. Post on industry forums and groups. 5. Comment on 10 other blogs within your industry. Add value with your comment. Don't even bother with one word replies. That wasn't so bad right! You just have to be consistent about this so you get as much exposure as possible to your blog post. As you get ninja with your blogging strategies you can add more syndication sources for more exposure. As you get to connect more and more with your audience on your blog you will start to see the same patterns of questions come up over and over again. You want to take note of those questions and answer them in a future post. Remember you want to be seen as a trusted advisor so listen and take note of what your audience wants to know more on. I know, I know, that was a ton of info to consume. But your next steps are easy ones. You must be crazy serious about your success to read this far. You understand that a blog is going to give you around the clock leverage like nothing else in your business. When trying to attract the attention of your customers and prospects should be spending 85% of your efforts getting their attention. The marketplace is so noisy. Your competing with cat videos, multiple open window screens, CNN, Facebook newsfeed and smart phones. Don't think the odds are in your favor. That's why building a blog makes you stand out because it's a space online where you control the volume and you control the mood. Your passionate about your network marketing business and that enthusiasm needs to shine through using a platform. The Kalatu Blog makes that happen in real time. Click below to learn how you can crush it as leader and earn the income you deserve through blogging. Enjoyed this post? Please like, comment, share. Sheena Yap Chan recently posted…Why are Domestic Violence Rates Increasing in Women? You have given some valuable information. I have been blogging for a couple of years now. Yet, you have shared some new tips. Will check some of these out. Thanks. Will tweet. Thanks for the awesome details on blogging. Implementing your plan will get people’s plan up and running in no time. Great comprehensive review of Kalatu and blogging as a whole. Any network marketer can benefit from using the viral blogging platform. They are definitely not created equal. Glad you found this post helpful Ginny! These are great tips and video on how to get started blogging. and this Kalatu platform is the best way to get started very quickly for any business. Thanks for sharing Yvar! Great post Yvar, you covered everything. Thanks for sharing.